Firefighters rappelled down a steep embankment to pick up the injured days-old horse. And when rescuers revealed his broken pelvis could lead to a ruptured artery, possibly making him bleed to death, fundraisers raised nearly $16,000 for his care. We at Care2 love success stories, and the story of Valentine the horse certainly qualifies. 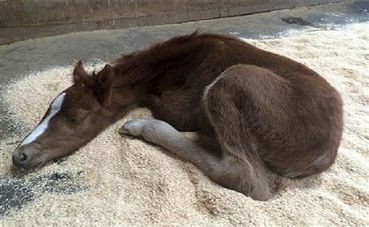 Even his name is a celebration: Rescuers named the foal after the holiday on which they saved him, Feb. 14. Just before noon that day, someone notified police about the horse trapped at the bottom of Morrison Canyon near Fremont, Calif. Rescuers found him sitting in a puddle of water with a broken pelvis and broken rib. Only about eight days old, he’d been stranded down there for two whole days. Animal control officer Sarah Cattaneo reports holding Valentine’s head comfortingly as the 80-pound horse trembled in fright. Firefighters used rope and other rescue equipment usually reserved for humans to extract Valentine from the bottom of the ravine. They then transported him to a veterinarian in Pleasanton, where he’d wait to go to UC Davis for surgery. For the rescuers, it was all in a day’s work. Meanwhile, nearly 200 people donated via the fundraising website GoFundMe for Valentine’s medical treatment within 24 hours. The page raised $15,233, far surpassing its goal of $10,000, and stopped taking donations on Tuesday. The Tri City Animal Shelter also accepted donations for Valentine’s care. Staff were floored by people’s support for the lone horse, whose owner is still unknown. Meanwhile, medical staff at UC Davis found surgery ultimately unnecessary because the expected break didn’t happen. Valentine’s now resting at the university for a few weeks as police investigate how he got into the ravine in the first place. His care will cost around $16,000. How’s that for a Valentine’s Day miracle? Sooo glad he was rescued. Kudos to the rescuers, animal control and firefighters, and medical staff for helping this little baby! Wonderful that this baby was rescued! Darling Barb... I signed and will forward for more help. Thank you for posting this for this precious little one! AGAIN SIGH!! Will someone pull out the Care2 petition please. My friends are noting, but one asked where the petition was. Some ARE note on Care2. Link please I have no idea how to do that. Noted and signed.. Thanks Barb. Thank you dear Barb and Marilyn for the forward. How in hell did Valentine end up at the bottom of this ravine, did he fall & why he has a broken pelvis & ribs. And where is his mother, she must be worried sick. I am so pleased he was found & rescued & is now on the mend! Poor little one for two days he just laid there in pain & suffering!